50 grams of cotton worsted weight yarn in a solid color. Shop sample is done in Lily Sugar N' Cream. Universal Cotton Supreme is another great choice. You will also need US 6 needles in either 24" circular, straights, or longer DPNs. We will be knitting a fun washcloth. 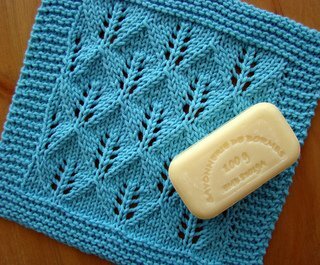 Please download and print the FREE pattern from Ravelry, Leaf Lace Washcloth by Jan Eaton. Please have materials purchased and pattern printed before the start of class. $5 fee to paid upon registration. $25 class fee to be paid to the instructor on day of the class.